When choosing Montessori for your child, you as a parent should be aware that the program is sequential. Maximum benefit is derived if the child enters the program by the age of three and remains in the same Montessori classroom until he/she is ready for the kindergarten year. 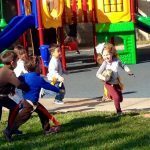 Our Preschool Program offers a complete curriculum including practical life, language development and writing, geography, mathematics, sensory education, history, biology, zoology and other sciences. In addition to the Montessori areas of the classroom, special projects or special units of study are integrated into the curriculum on a monthly basis. These projects may include: circle activities, art and cooking projects, creative movement, oral language/auditory processing, written language, reading groups, grammar, math lessons, cultural projects, sciences, music and outdoors activities such as gardening, games and etc. Montessori education encourages students to attend school on a consistent and regular basis to gain the greatest academic and social advantage from the classroom environment and lessons. This will also ensure your child is learning from the lesson presentations that vary in scope and content throughout the week. Preschool Class Day curriculum is 8:30am to 2:30pm. Our Preschool program is a five day program. We understand the challenging decision that parents face when trying to decide whether or not they should continue their child with Montessori for kindergarten, or enroll him in their local school. There is no right answer for every child. Montessori is focused on teaching for understanding. In the primary preschool classroom, younger children receive the benefit of sensorial preparation for academic skills by working with concrete Montessori materials. This concrete experience allows the child to form a mental picture of the concept taught. For example, how big a thousand is, how many hundreds make up a thousand, and what is going on when borrowing or carrying over numbers in mathematical operations. All of the earlier preparation in the practical life and sensorial areas now find academic outlets in the Kindergarten program. This program continues to build up on the children’s academic foundation in math, writing, reading and art. In addition to a wide range of science, geography and cultural areas. Our goal is that each kindergartener will have mastered the Kindergarten California State Standards, as well as been introduced to even higher-level concepts. After completing our Montessori Kindergarten program we guarantee your child will be more than prepared for his first grade year. Once children have developed a high degree of self-confidence, independence and enthusiasm for the learning process, they can quickly adapt to all sorts of new situations. By the time your child is in the first grade, he/she will be able to go off to the new school with not only a vibrant curiosity, but also excitement about making new friends and learning new things. Kindergarten Class Day curriculum is 8:30am to 2:30pm. Our Kindergarten program is a five day program. Before and afterschool care option is available. Lodi Montessori conducts an exciting and educational summer program that is offered as a component of the yearly program, from June through July. Summer school consists of seven weeks and is intended to be a fun and relaxing time for your child. Summer activities will relate to the children’s favorite areas of learning during the school year. Additionally, there will be various hands-on activities for the children during weekly themes such as the ocean, the zoo, occupations etc. Fun, outdoor water games will also be implemented to “beat the heat.” First consideration for this program will be given to current students and all remaining students will be placed on a waiting list until an opening occurs. Before and after school child care is available from 7:00am to 8:30am and 2:30pm to 5:30pm. Children can choose to do art and crafts, reading, games and other various activities during this time. There may also be a playground recess if the weather permits. Healthy snacks will be provided at no additional cost. The 5 days per week, FULL Day program includes before and after school child care, at no additional cost. For all other programs, before and after school child care will be available with the purchase of our “Convenience Care Card.” Contact the school for details. To apply for enrollment in Lodi Montessori, families will complete a tour/interview with the Director during which the dynamics of our school will be discussed. This will also serve as an observation day for the parents to familiarize themselves with Lodi Montessori and to find answers to any questions they might have. The Director will also meet the child and spend some time in the parent’s presence talking with the child. If both parties feel that the school would be a good fit for the child and family then the enrollment process can move forward. A ‘new student’ enrollment packet will be given and the family and school can proceed with the admission process. Children may enroll in Lodi Montessori after their name comes to the top of our waiting list, they meet the minimum age and toileting requirements, and after all required fees and first months tuition has been paid. Siblings of enrolled children are placed on a separate waiting list and have the option of enrolling before children on the general waiting list.